Product categories of Steel Ladders, we are specialized manufacturers from China, Steel Ladders, Foldable Steel Ladder suppliers/factory, wholesale high-quality products of Household Steel Ladder R & D and manufacturing, we have the perfect after-sales service and technical support. Look forward to your cooperation! Steel ladder step board is also known as the Stair Step Board, which according to the installation method, generally can be divided into welding and screw fixation of the two types, if the direct welding to the keel and do not need to step step plate side, relatively more economical Durable but not disassembled. Bolts are fixed on both sides of the Stepping Board to be thickened and the side plate is perforated and mounted on the side plate, which is directly bolted and can be recycled in use. 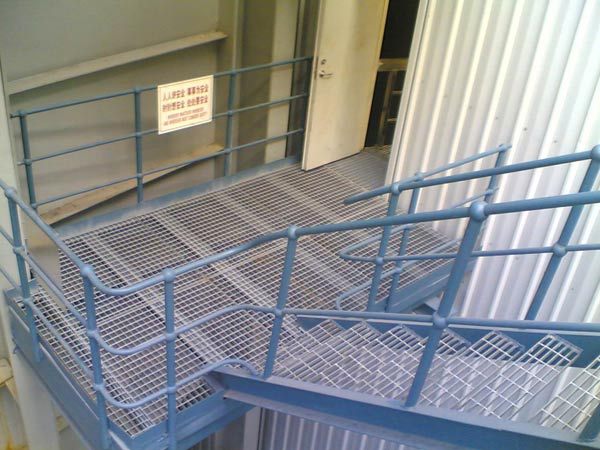 The steel staircase plate is made of Steel Grating (the steel grating is crossed with a certain spacing and crossbar and is welded into a steel product with a square grid in the middle). The product surface is generally hot-dip galvanized, electro-galvanized. Steel staircase is mainly used for industrial platform, ladder pedal, handrail, channel floor, railway bridge side, high-altitude tower platform, drains, covers, road grille, three-dimensional parking, institutions, schools, factories, enterprises The staircase of the cause, the sports field, the garden villa can also be used as the outer window of the house, the balcony guardrail, the highway, the railroad rail and so on. The pedal is made of steel grating plus non-slip and side plate. Mainly used for stepping on the steel ladder, it is usually called Staircase Stepping Board, referred to as the ladder pedal. According to the installation of steel ladder pedal is divided into welded fixed ladder and bolt fixed pedal. One of the welded staircase pedal, that is, steel grating, bolted ladder pedal need to add a steel grating 65x5mm flat steel as a side plate.